Jeepneys in the Malate district, City of Manila, with trips to Makati, Paco, and Pasay were found to dispatch vehicles based from previous experience and perceived demand as bases. The researchers hypothesize that due to the improper assessment of demand there is an oversupply of vehicles in all three routes. Furthermore, the inefficiency caused by this operation resulted to high fuel consumption and cost and oversupply of manpower. The main objective of the study is to propose a scheduling scheme that could improve the efficiency of the jeepney operation and service in the area of Malate, city of Manila. To accomplish this, the researchers evaluated the level of service (LOS), in terms of speed, headway and jeepney service cycle of operation; and its transport work efficiency in terms of seat-km offered and passenger-km utilized. Based on the traffic conditions, the researchers identified the important variables to improve efficiency that would satisfy the demand at the maximum load section of each route while keeping in context the possibility of applying an occupancy load (level) that would be comfortable to the onboard passengers in most of the route length. Savings on man-hours of manpower (i.e. driver) and fuel cost were also estimated as a result of the efficiency in jeepney service operation. CE Faculty members, Dr. Danilo Terante, Dr. Alexis Fillone and Dr. Andres Oreta attended the 9th National Civil Engineering Education Convention with the theme, "Moving Towards an Outcomes-Based Education" held on July 14-16, 2011 at the University of San Jose - Recolletos (USJ-R), Cebu City. The convention was organized by the Association of Civil Engineering Educators of the Philippines (ACEEP). On the first day, Dr. Fillone presented the PhD Program in Civil Engineeering which will start in 2012. He also discussed the ERDT scholarship and proposals related to the PhD program like a research-based and special (summer) programs. Dr. Oreta, on the otherhand presented a paper about the Laboratory Course in Theory of Structures at DLSU where TecQuipment Structures Modules are used in class. The second day highlighted the lecture-workshop on Outcomes-Based Education with DLSU ME part-time faculty Dr. Manuel Belino (now Dean of ME, Mapua Tech) and Dr. Oreta as resource speakers. Dr. Belino presented about the ABET Model for OBE. Dr. Oreta, on the otherhand, presented OBE concepts for writing course learning outcomes and converting syllabi to OBE-format. Dr. Terante was a facilitator in the OBE workshops. Dr. Terante is the current president of the ACEEP and he announced that the 10th CE Education Convention will be hosted by DLSU-Manila sometime in September 2012. 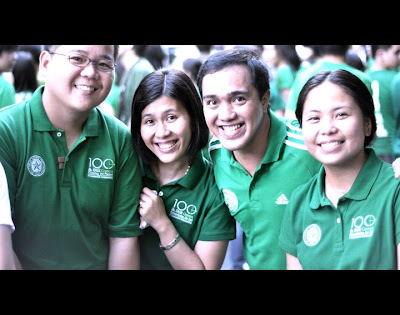 Incidentally, the DLSU CE Dept. will be 25 years in 2012. This study aims to apply the cam clay model to predict the behavior and at the same time determine the shear strength parameters of some selected mine tailings in the Philippines namely Negros Oriental copper mine tailings, tailings from aggregate quarry in Cavite and Davao gold mine tailings. Tons of mine tailings are contained in dams which serve no purpose and could pose as threat if ever dam failures would occur and it is the interest of this paper to determine which among these three mine tailings possess strength parameters which may serve as constru ction materials. 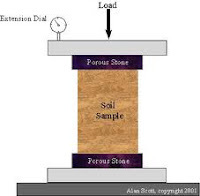 Three types of tiaxial tests, unconsolidated undrained test, consolidated undrained test and consolidated drained test, were conducted on the mine tailings in the determination of the shear strength parameters. The results of these tests classified tailings from aggregate quarry in Cavite as the mine tailing which has the greatest strength followed by the Davao gold mine tailings and lastly, the mine tailing which exhibited the least strength is the Negros Oriental copper mine tailings. Among the three mine tailings, the tailings from aggregate quarry in Cavite is considered to be the most suitable tailing which may be used as construction materials. 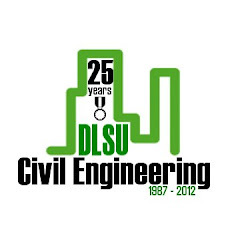 The Civil Engineering program was revived at De La Salle University, Manila in 1987 and come 2012, the program will be 25 years. Thanks to a dedicated faculty. In the span of about 17 years of teaching at DLSU, I have worked with both senior and junior faculty members who have shaped outstanding Lasallian civil engineers. Let me write about the faculty in recognition of their untiring service to the university and the students. As I see it, the fulltime CE faculty members may be grouped into three generations – the grouping is not necessarily based on age but rather on milestones in the history of civil engineering education at DLSU, Manila. The 1st generation which I will refer to as “The Pioneers” are the faculty members who started or revived the BSCE program at DLSU. 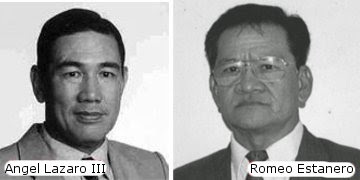 This group include the “founders” like Dr. Angel Lazaro III, the College of Engineering Dean who proposed the revival of the program and Dr. Romeo Estanero, the man behind the unique and specialized BSCE curriculum at DLSU and the first Department Chair. The other fulltime faculty members who pioneered this program were Dr Lydia de Castro, a PhD graduate in Geotechnical Engineering, Antonio Tansingco, an MS graduate at Stanford University, Manuel Vergel, a Hydraulics Engineering expert and Leopoldo Polintan (M.Eng., AIT). This 1st generation of CE faculty members who are now retired used effectively the blackboard and the overhead projector in their instruction and various teaching aids like models and posters. Dr. Estanero was the last pioneer when he retired in Dec 2007. In the early 1990’s the department has to hire younger faculty members to address the growing population of CE students. Imposing the strict policy of Dr. Estanero, only civil engineers with at least a Master’s Degree were hired. I dubbed this 2nd generation of faculty members as “The Specialists.” Why? 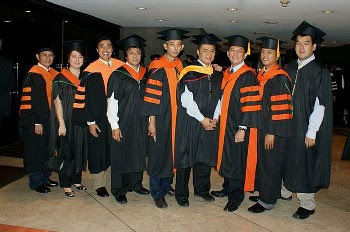 Because it was during this period, that the department started implementing the specialization program – starting with Structural Engineering (STE) and Construction Technology and Management (CTM), then followed later by Hydraulics and Water Resources Engineering (HWR) and Transportation Engineering (TRE). The 2nd generation fulltime faculty members include Ronaldo Gallardo (MS, PLM), Francisco Franco (M.Eng., AIT), Alexis Fillone (M.Eng, AIT/ PhD, UP), Danilo Terante (M. Eng. Ed., DLSU / PhD, UP), Renan Tanhueco (M.Eng., Nagoya U/ PhD, UP), Andres Oreta (M.Eng & D. Eng., Nagoya U), Edgar Dona (MS, Virginia Polytech, USA / PhD, UP), Joseph Manalo (MS, PLM) and Bernardo Lejano (MS, UP / D. 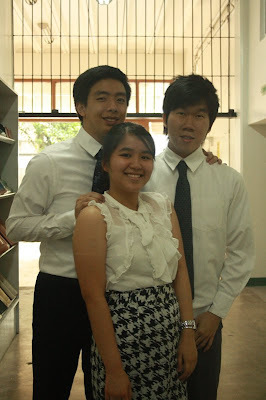 Eng., Nihon U). These faculty members went through various transitions in their teaching methods from blackboard instruction, OHP technology to Powerpoint presentations. The “Specialists” were active in presenting in many conferences here and abroad. Many of these faculty members earned their PhD Degrees while teaching fulltime at the university. One of the achievements of this generation is the department being selected as CHED’s Center of Development in Civil Engineering. The department also received a university recognition as the most productive department in research. In ten to fifteen years, this generation will retire from the university. 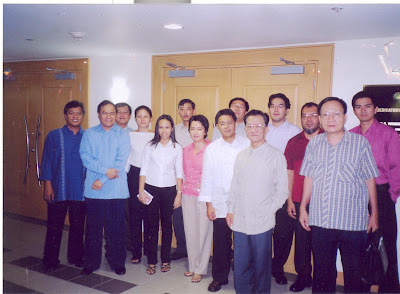 The 3rd generation consists of relatively young and energetic faculty members – a number of them were students of the 1st and 2nd generation professors in either the undergraduate or graduate programs at DLSU. I will refer to them as the “The Transformers” because it was during their time that new teaching and learning paradigms like “Transformative Learning”, "Student-Centered Learning" and now “Outcomes-Based Education” were introduced at the university. These new breed of faculty members are challenged to transform their teaching strategies considering that they have access to new technologies in the classroom like the thin client (a multimedia with projector and speakers and connected to the internet) and various internet applications like Facebook, YouTube, Google Earth and blogs. The Transformers and The Specialists - Ready for Battle! The Transformers include DLSU alumni and former faculty members, Agnes Galang and Cris Castillo, DLSU MSCE graduates, Jason Ongpeng, Dr. Jonathan Dungca, Mary Ann Adajar and Alden Balili, AUN-SEED Net MS graduates from Chulalongkorn University, Irene Ubay, Cherry Capiz and Nicanor Roxas, Jr. Newly hired Dr. Mario de Leon and soon to be hired Dr. Lessandro Garciano (also a DLSU MSCE graduate) also belong to this group. The Transformers have a great task ahead of them. 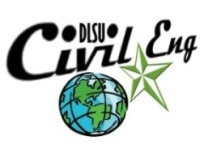 They are challenged to succeed in applying outcomes-based education and transform Lasallian students into professional civil engineers who are critical thinkers, effective communicators, lifelong learners and service-driven citizens. The Next Generation? The Pioneers have laid the foundations of the BS and Master’s Program in DLSU. The Specialists have erected the four pillars of the civil engineering specializations in STE, CTM, TRE and HWR. The Specialists have a great task also of offering the PhD-CE program. The Transformers must sustain the specialized curriculum and expand the program to include the Geotechnical Engineering specialization and many of them must earn their PhD degree. The challenge to the next generation is not only to continue the department’s tradition of excellence in instruction, research and community service but to produce globally competetive professional civil engineers who can make an impact in shaping our country and the world. The fourth generation - GLOBALIZERS?